It's IntLawGrrls' great pleasure to welcome Susan A. Bandes (left) as today's guest blogger. 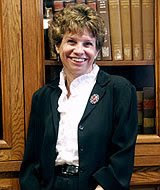 Susan is a Distinguished Research Professor of Law, as well this year as a Wicklander Fellow, at DePaul University College of Law in Chicago, where she teaches Criminal Procedure, Federal Courts, and Law and Literature. She's a pioneer in the emerging study of the role of emotion in law; New York University Press published the anthology on the subject that she edited, The Passions of Law, in 2000. Susan's also noted for her scholarship in federal jurisdiction, criminal procedure, and civil rights. Having earned her B.A. degree from the State University of New York at Buffalo and her J.D. from the University of Michigan, Susan practiced at the Illinois Office of the State Appellate Defender and as staff counsel for the Illinois American Civil Liberties Union before joining the DePaul faculty. Her recent pro bono activities include acting as co-reporter for the Constitution Project’s bipartisan Death Penalty Initiative, which produced the report Mandatory Justice: Eighteen Reforms to the Death Penalty (2001), and serving on the advisory board for a study of the Cook County, Illinois, criminal justice system, described here and conducted by the Chicago Appleseed Fund. In her guest post below, Susan discusses the comparative criminal justice analysis that she undertakes in Protecting the Innocent as the Primary Value of the Criminal Justice System, her forthcoming review of a new book on innocence and criminal justice. For reasons she sets out in a further post below, Susan dedicates her contribution to the late newspaper columnist Molly Ivins, who joins other IntLawGrrls transnational foremothers in the list below our "visiting from..." map at right.